From Google's interpretation of rel="canonical" to the specificity of anchor text within a link, there are several areas where we thought Google would make a move and are still waiting for it to happen. 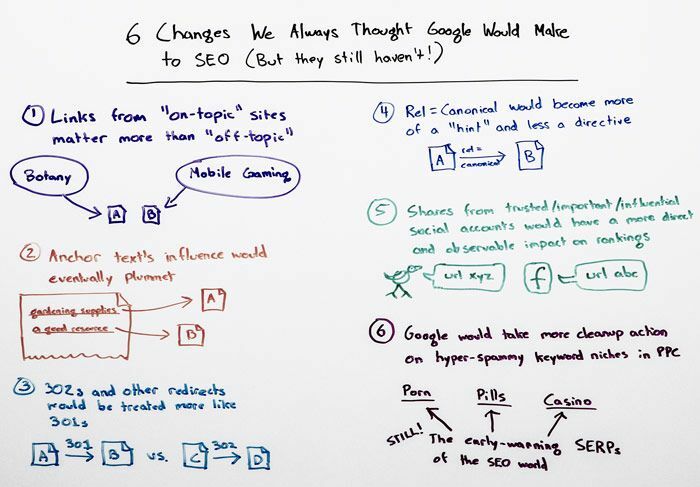 In today's Whiteboard Friday, Rand details six of those areas. Let us know where you think things are going in the comments! How Can Small Businesses/Websites Compete with Big Players in SEO? Should My Landing Page Be SEO-Focused, Conversion-Focused, or Both? Does Voice Search and/or Conversational Search Change SEO Tactics or Strategy? Should SEOs Only Care About DIRECT Ranking Signals in Google? Can SEOs Stop Worrying About Keywords and Just Focus on Topics? Is Brand a Google Ranking Factor? Should I Rebrand and Redirect My Site? Should I Consolidate Multiple Sites/Brands? Is It Possible to Have Good SEO Simply by Having Great Content. Scaling Geo-Targeted Local Landing Pages That Really Rank and Convert. How to Acquire Anchor Text-Rich Links Without Resorting to Spam or Manipulation. How Some Companies Succeed at Converting Visitors yet Fail to Earn Great Customers. How Google is Connecting Keyword Relevance to Websites through More than Just Domain Names. When Keyword (not provided) is 100 Percent of Organic Referrals, What Should Marketers Do? Are Links Losing Value in Google's Algorithm? How Can Mobile SEO Help my Non-Mobile or Local Business? What if Your Ugly Website is Holding Back Your Marketing Efforts? Does SEO Boil Down to Site Crawlability and Content Quality?